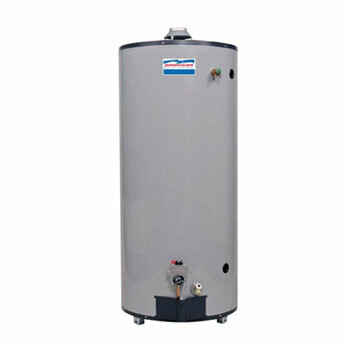 American Ultra-High Recovery units of er high performance for applications requiring highest hot water outputs. 2" Non-CFC Polyurethane Foam to prevent heat loss and reduce energy cost. Factory-installed Side Temperature & Pressure Relief Valve. Aluminized Steel Multi-Port Burner on long life in natural gas units. Cast iron burners for propane. Combination Thermostat/Energy Cut-Off (all models require 4" venting). Tested and listed with CSA International in accordance with the latest addition of ANSI Z21.10.3 or CSA 4.3, CEC and EPCA-2005 approved. All models are certified at 300 PSI test pressure and 150 PSI working pressure.